“Blizzard warning in effect until 12 a.m. CST Monday. Heavy snow accumulation …. 10 to 16 inches…. With isolated higher amounts possible. Northeast winds will increase with 20 to 30 MPH with occasional gusts to 45 MPH.” That is the message from the Weather Channel on the snowstorm we are having in Chicago. And from the inside of my warm apartment, looking out over the blowing snow, with the sound of wind swirling around my building, going outside is NOT the thing to do. But, outside, I did go. The story from the ground is very different. 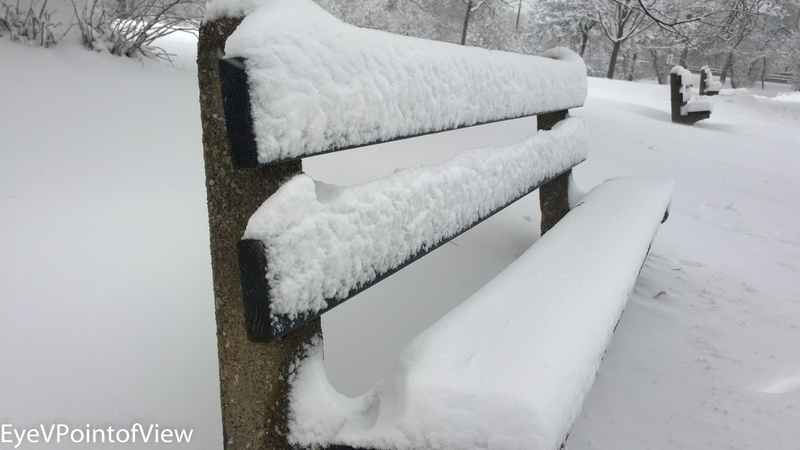 From that point of view, the snow covered trees lined the streets, park benches and tables covered with inches of snow, snow covered vehicles – 2 wheeled, and 4 wheeled – the snowy day is beautiful. I didn’t have to walk far (good thing, because it really WAS windy! ), and I didn’t have my regular camera, but I had a good time trying out an alternative one. Not the full silence you have after a huge snow fall, but sounds dampened by snow… cars and other ground level objects blanketed by snow. I hope you enjoy these 5* selections from my short walk. 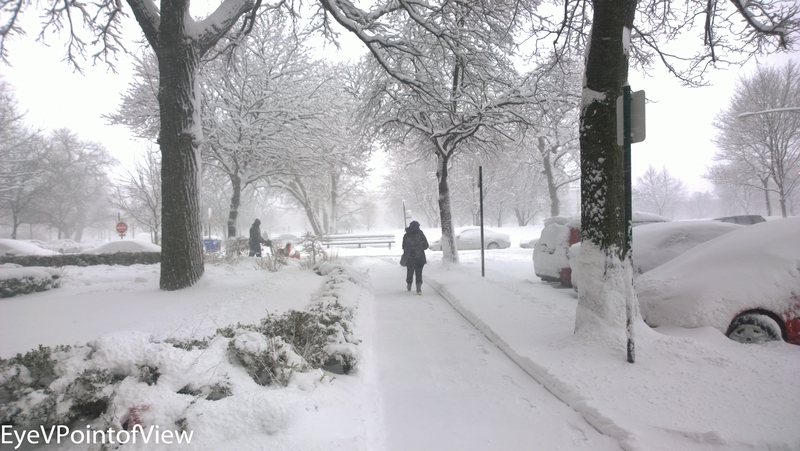 Be Prepared – Winter weather is no joke. 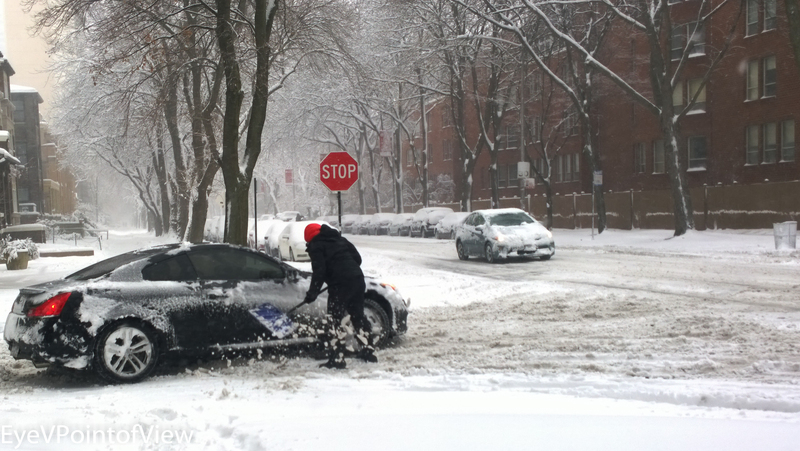 And this driver was prepared for all possibilities, having had the foresight to pack a shovel in his car. What you can’t see (because I didn’t have the nerve to take THAT picture) is that the driver has on goggles and a face mask to ward off the driving snow. I love the vivid red that ‘pops out’ against the snowy background, and the snow being thrown off the shovel. 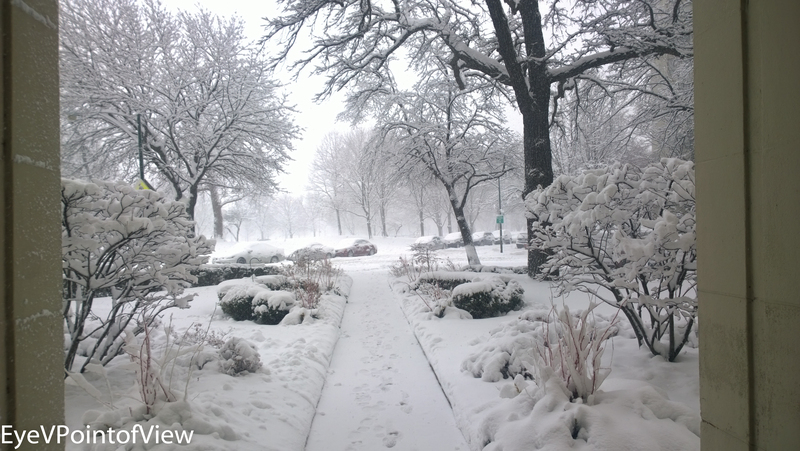 Snow-Covered Boulevard – The scene from the street, walking along Hyde Park Boulevard, brick residences on the right, and trees to the left, a canopy around the snow covered walkway. 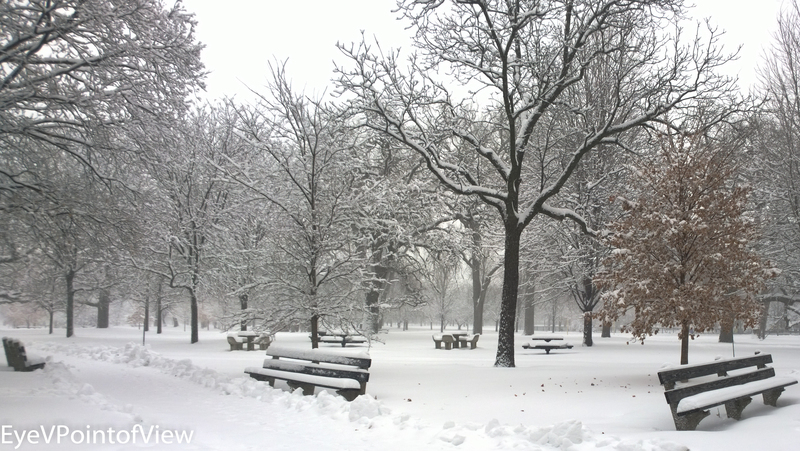 Gathering Place – This park corner, a gathering spot for chess players is a study in snowy solitude. The chess tables and benches are fully encased with snow. I love the spot of color created by the tree with leaves (yes, brown IS a color)! 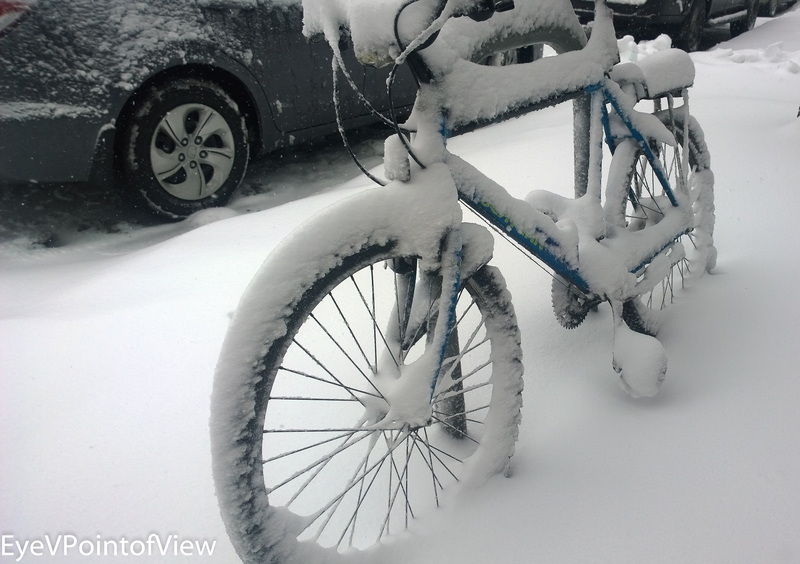 Snow Covered Vehicle – Bikers ride year-round in Chicago, so it is no surprise to see this bike waiting for its owner. 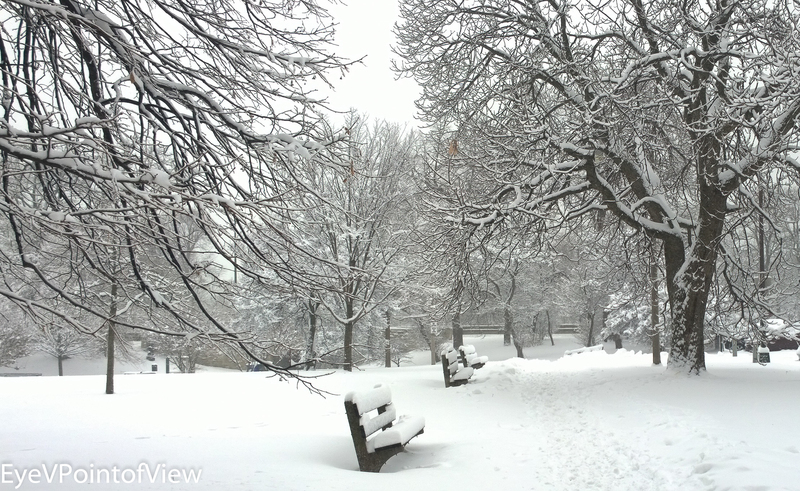 It makes for a quintessential snowstorm shot. Park Entrance – The park entrance is fully covered; only a few people braved the winds to head out to the open lakefront (not me!). 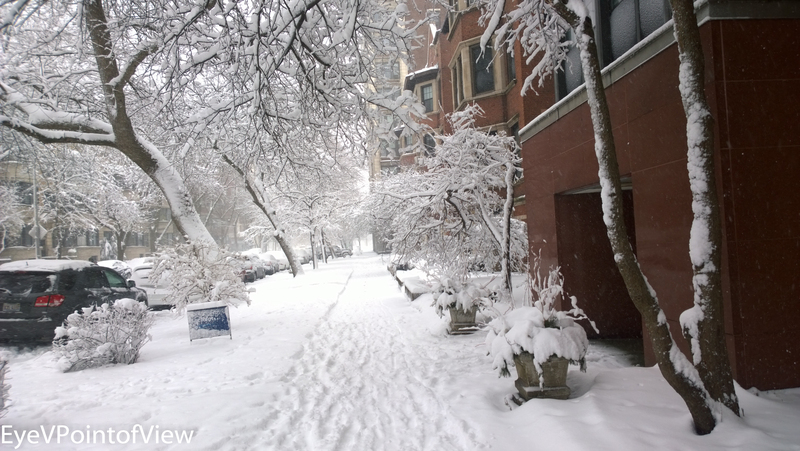 Powdered Over – That powdery stuff looks really different from this perspective, doesn’t it? Snow Blowers Help, But … — Having the right equipment for this kind of blizzard is critical, because as fast as you clear it up, it comes back. The snow-blower operating in the background made a cleared a path, but while he was still working, it covered back up! As I write this, the blizzard is still underway. And if you were out driving in it, or trying to fly in or out of Chicago, it probably wasn’t much fun. But, for me, walking around was just beautiful. Hope you enjoyed my point of view from this walk! Well of course you were out in the snow! LOL. Nic pics. Very pretty if you don’t actually have to drive, work, go to school, etc. Exactly! For those who are driving, not so much! Thanx for your comments.